So that's all she wrote for 2016. Holidays are over, gifts are given and unwrapped and the jeans no longer fit. Or at least that was my experience this morning…too much Homemade Egg Nog! Carpenters are back on the job this morning, kids are back in school and we had a very nice relaxing last couple of weeks of 2016 and now it's back to work for me too. Rob's job for this week wasn't ready this week so he's still here…and after three weeks of him messing up my normal routine, I do need the stamping therapy so it's a win:win that I'm back in the office. Today is the very last day that you can order from the Holiday Catalog. Here's a link to the following retiring items. Get these items before they are gone forever. You know you will kick yourself if you miss out. These are the things that are on the Carryover list. They will be around for a little longer so you can think about it a little more. This adorable set ..Jar of Cheer will be leaving us. This card was shared with me by one of my group members, Nancy Sutter. She was one of our featured display stampers for a recent group meeting and this was one of the cards that she created for her display board. Super Cute, hey? 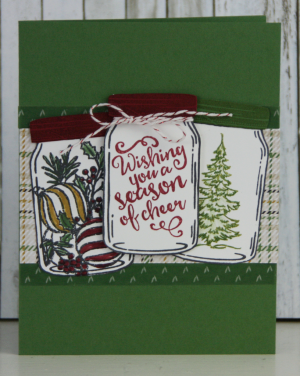 This set, Jar of Cheer, is only available thru today. Don't delay. It coordinates with the Everyday Jar Framelits for the Annual catalog. That's all for today…I need to get back to productivity!